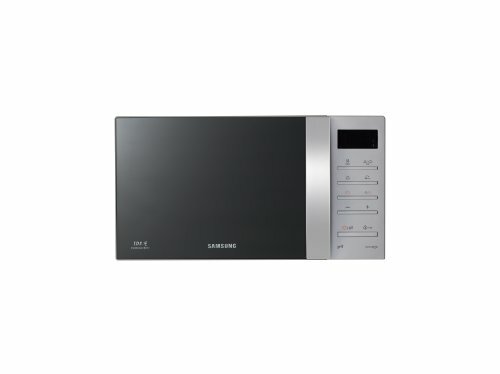 The Samsung GW76VT-SS is a grill microwave featuring a silver finish, 20 litre capacity and 750w of power. Well built, and looks smart. Might be a little small for larger families - the controls aren't well labelled either. The overall look and feel of this microwave impressed our testers - it's incredibly sleek, and build quality is very good. If you want a modern and understated silver microwave oven with a grill for your kitchen, then this model ticks the boxes. The controls are situated on the right hand side - all of the buttons have a nice solid action, but unfortunately they are let down by the labelling - featuring only symbols rather than text - this caused us to repeatedly check the guide book in order to operate the microwave. In time we're sure you'll remember the function of each button - in the short term it can be a touch long winded though. Inside you'll find a removable glass turntable, that measures a rather small 25.5cm in diameter. In short we would recommend this microwave - it works very well, as you'd expect from Samsung - however it may be unsuitable for the elderly due to the slightly confusing controls. A well built microwave from Samsung. The controls are a little confusing initially, but once you've got the hang of them, it works very well.